Whenever he’s in the Bayou City, the gregarious Houstonian can be found behind the counter at Gordy & Sons selling guns and catching up with clients, many of whom are good friends. 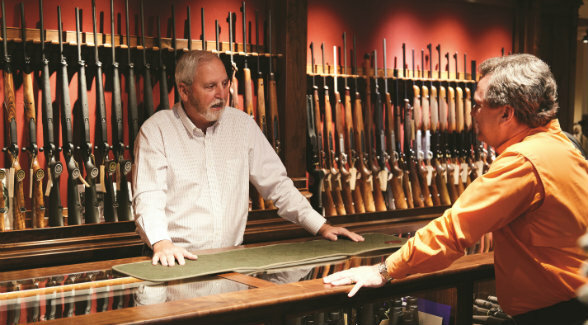 Russell Gordy has a simple goal for Gordy & Sons: to be the world’s greatest gun store. (pictured above) is thrilled to be teaching his own grandsons how to shoulder a gun, lead a target, and take down a crazy quail. In the late 1950s, a very young Russell Gordy used to tail an older cousin as they roamed around their grandparents’ farm in West Louisiana. He begged the older boy for a chance to shoot his Sears J.C. Higgins bolt-action, single-shot .22 rifle, but his cousin always refused. He was out of ammo, he would say. Or so it seemed until he shouldered the rifle and ventilated a tin can, much to Russell’s ire. Come nightfall, Russell would devour the dozen or so pages devoted to rifles and shotguns in the Sears & Roebuck catalogue. ”That was our Internet,” he says today. On more than one occasion, he told his grandmother Ocie Gordy that he was going to buy every last one of Sears’ guns. Impressed with her grandson’s ambition but worried about his goal-setting abilities, she gently urged the boy to stop torturing himself. “Grandma, if I can ever afford to, I’ll buy every one of those guns,” he would say. Russell never did buy all of Sears & Roebuck’s inexpensive, mass-produced guns, but in 2014, after a successful career in the oil and gas business, he bought two years of production by John Rigby and Co., one of world’s most storied gunmakers, as well as scores of other shotguns and rifles from Boss, Stephen Grant, James Purdey and Sons, and other London gunmakers. 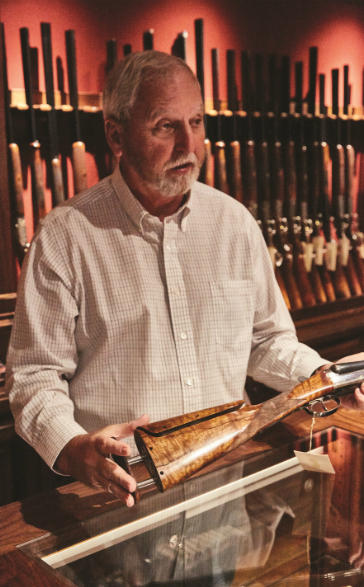 To his cache of Best guns (a term used to describe those crafted by London’s finest gunmakers), Russell added exquisite shotguns and rifles handcrafted by Europe’s elite makers. 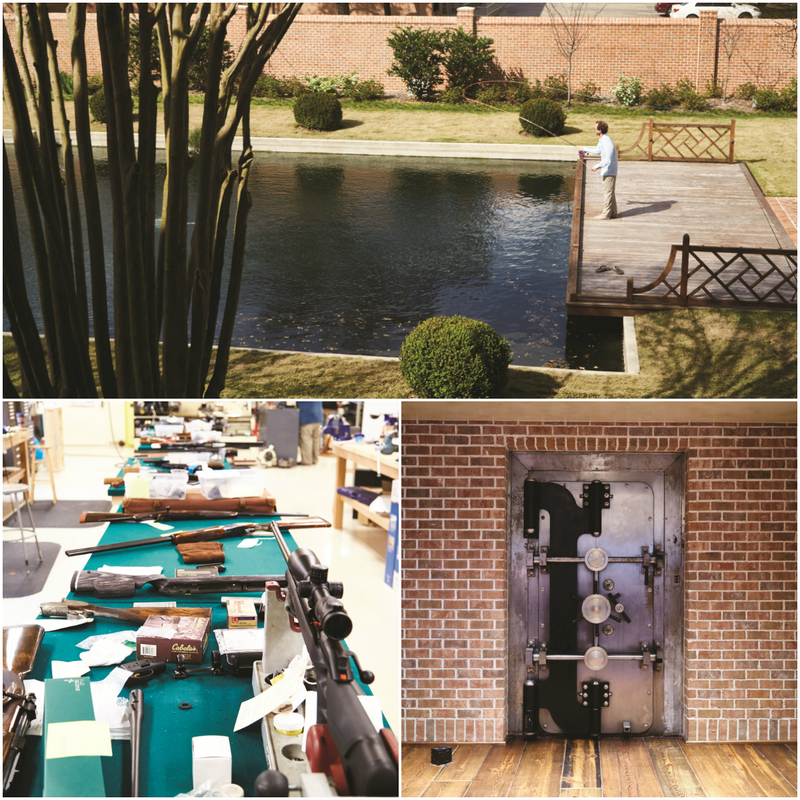 At any given time, some 800 of the world’s finest firearms rest in the company’s two vaults in Houston. 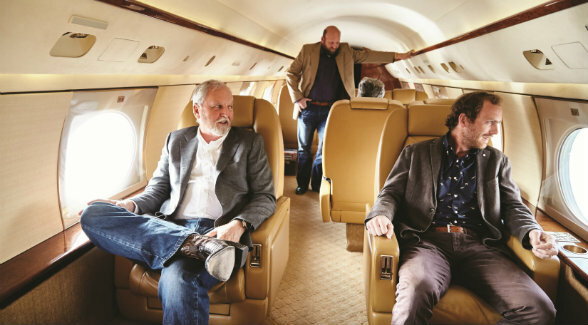 Gordy & Sons constantly refreshes its inventory by acquiring guns from individual collections, at estate sales, and, as mentioned, directly from top gunmakers themselves. 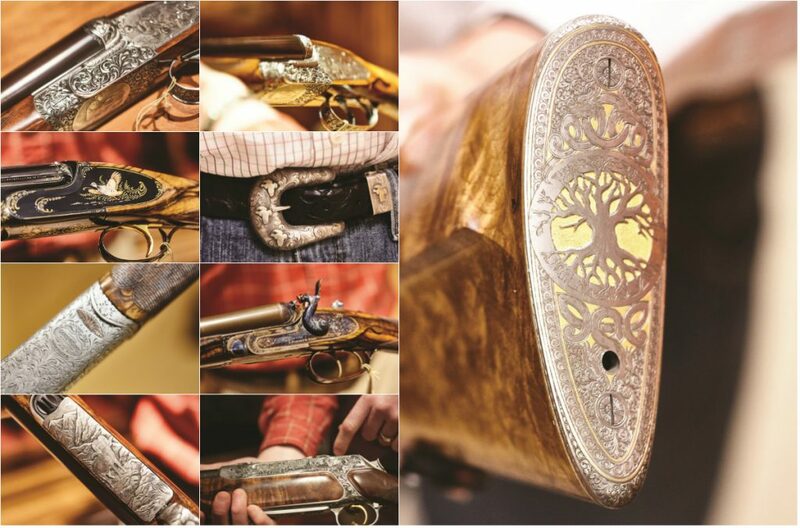 Nowadays, when aficionados want to sell world-class custom rifles and shotguns, their first call is to (713) 333-3474. ROAD SHOW: Gordy and sons flew from the Bayou City to Big D to attend Park Cities Quail’s 12th annual dinner and auction. The March 8 event grossed more than $2.2 million, including Russell’s $200,000 winning bid to hunt pheasant with Tom Brokaw at Paul Nelson Farm in South Dakota. Russell’s grandfather George Gordy was an avid quail hunter back in the day when small farms in the Deep South still held plenty of bobwhites. He’d pick up extra money putting on trick shooting exhibitions in the country towns close to Leesville. Winchester provided him with a Model 12 with cylinder-bore barrel — a rarity. The Model 12 nearly always came with a full choke. “Grandaddy could throw up seven potatoes and bust them all with that Model 12,” Russell says. Another trick of George Gordy’s was to light a match with a single shot from a .22. With his next shot, he’d put the same match out. One suspects Mr. Gordy bagged his share of birds. At 16, Russell took his first paycheck from rough-necking, went straight to the nearest Globe store, and bought a 12-gauge Remington Model 1100 for $87. “I’ve changed my shooting habits, but as a boy I wanted the biggest gun I could get. (Nowadays, he shoots a three-pound Hunter & Son .410 side-by-side.) After earning an accounting degree from Sam Houston State in 1973, he went to work for Transco Energy. The corporate tempo at the huge pipeline firm didn’t suit him, and he began scouring the Houston Post and the Houston Chronicle for greener pastures. Over the next several years, Russell worked in exploration, engineering, and operations. As the company grew, he served as chief troubleshooter, traveling the world, fixing problems, and buying and selling businesses. The last job he did for the company was to sell it in April 1981. Nevertheless, he found the ups and downs of wildcatting agreeable and ultimately profitable. “Back then, before the advent of shale, you’d hit oil one out of ten tries,” he says. “When you’re dropping $5 million on every dry hole, that tenth one had better be a good one.” With the oil embargos of the 1970s still on everyone’s mind, the early 1980s saw a short-lived boom. Thousands of rigs were operating in the US. In 1982, Russell scraped his nickels and dimes together and bought part of an old plantation in the Piney Woods near Lake Livingston, some 80 miles northeast of Houston. “I wanted my boys to have what I had, to know something besides the suburbs,” he says. For the first few years, a corrugated metal barn sans running water was their home place. Roughing it suited Russell, Shaun, and Garrett. Glenda, who grew up in rural Louisiana, went along with the arrangement until one winter morning when she woke up to find a large wood rat snuggling with her. She calmly woke Russell and told him to get the damn thing off her at once. Construction on a proper cabin began forthwith. In 1985, Russell sold his first company right before oil prices collapsed. Despite the disappointments inherent to the energy business, the overall trend has been sharply upward since then. Oilfields purchased at bottom dollar, coal bed methane drilling, and sophisticated minerals exploration have added hundreds of millions to his fortune. In 2004, he acquired the mineral rights to some 1.5 million acres through a deal with U.S. Steel. Thanks to these successes, Russell’s original 113-acre Piney Woods acreage has grown to more than 8,000 acres. 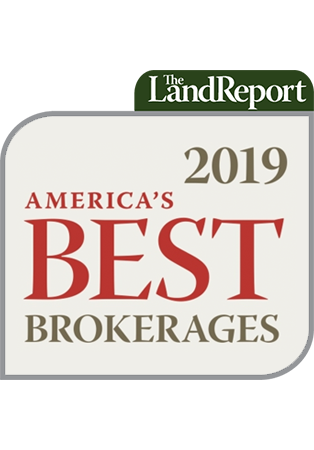 He also owns the 48,000-acre Double Arrow Ranch on the Yellowstone River in Montana, an 80,000-acre ranch in Wyoming, and the 19,000-acre La Ceniza in South Texas. An additional 22,000 acres of timberland in Wisconsin are a recent addition to his portfolio. All told, the native Houstonian ranked No. 68 on the 2017 Land Report 100 with 212,000 acres. TOP: Garrett Gordy volunteered to oversee the store’s fly-fishing operation. He is shown here plying his craft at the on-premise casting pond. LOWER LEFT: Gordy & Sons boasts five gunsmiths on-staff. LOWER RIGHT: The 18,000-pound vault door is a memento of Old Houston that Russell relocated from South Main Bank’s shuttered downtown location. Although Shaun and Garrett have access to the finest hunting and fishing in North America, they still consider the family’s original Piney Woods property their favorite. “Their love of the outdoors, hunting, fishing, and guns grew out of their boyhood experience on that place,” Russell says. “So many memories were made there. How can you forget your mom hosing you off at the back door after you’ve come in from four-wheeling?” In the not-so-distant future, the Gordys plan to develop a Southern-style quail plantation and English-style shooting school on the property. Houstonians pressed for time will be able to shuttle to and from the club via helicopter directly from Gordy & Sons. As his acreage increased, Russell’s gun collection swelled, from a few to a lot to who knows how many. “I really don’t want to know how many guns I own because I don’t want to have to tell my wife if she asks,” Russell says. Still, Glenda has a good sense of the scale of the collection; she often jokes that if the family lost everything but the guns, she could sell them for a dollar each and still be rich. His younger son, Garrett, a fanatical fly fisherman, loved the idea, but he insisted that the store should include a flyfishing component. He volunteered to take charge. The interior of the main vault was custom-crafted by Julian & Sons Fine Woodworking. 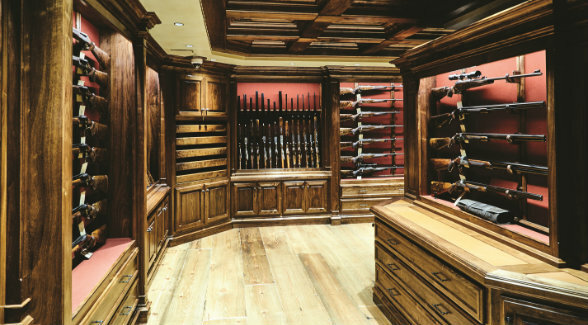 Among the many treasures it houses is the worlds largest inventory of Purdey shotguns. Shaun, who oversees the family’s energy interests, was tasked with electrical setup, and Garrett handled the interior design. The west wall was knocked out to bring in the 18,000-pound, 1932 vintage vault door from South Main Bank. Russell’s next move was to staff up. 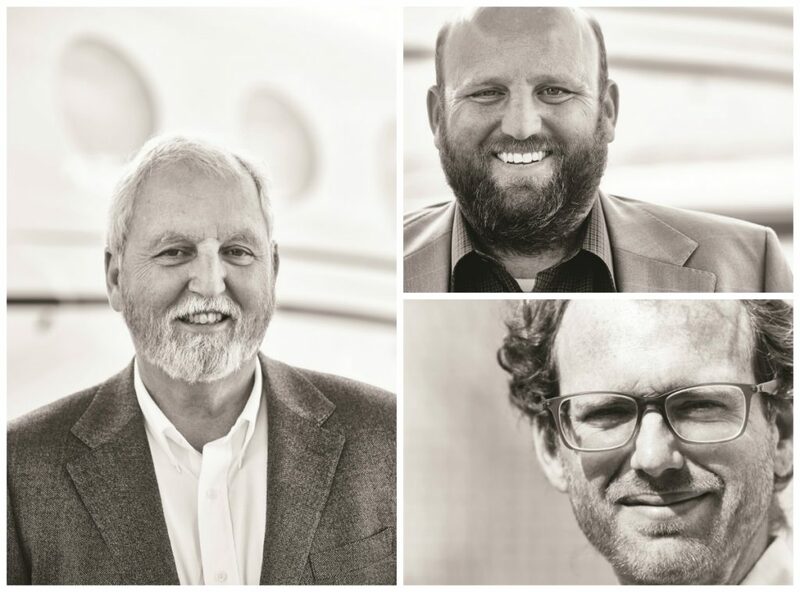 He brought in two standouts when he lured Mike Burnett and Noah Craven from Kevin’s Fine Outdoor Gear and Apparel in Thomasville, Georgia. Mike oversees the gun department, and Noah may well be the best gun salesman outside of the Middle East. When it came to fly fishing, Garrett knew exactly who he wanted: Marco Enriquez, a maestro known far and wide. Marco brings decades of insights and experience from Orvis and other top shops to Gordy & Sons — at least when he’s not slinging saltwater flies at redfish. By opening day – May 13, 2017 – Bob Waltrip’s old office building had been transformed into 11,000 square feet of luxury retail space, featuring longleaf pine floors, stamped copper ceiling panels, oriental rugs, oversized leather furniture, and walls covered with sporting art. 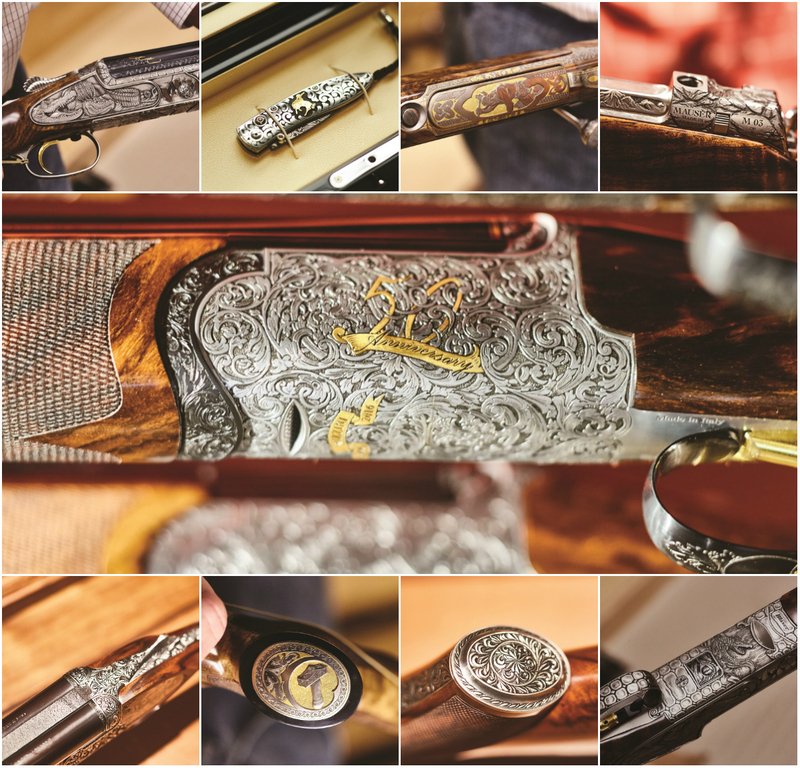 Rigby, Purdey, Boss, Francotte, Beretta, Rizzini, Krieghoff, Blaser, Woodward, Browning, Stephen Grant, Perazzi — all arrayed in racks and cabinets and drawers and each one graced with the handiwork of the world’s finest engravers. At the time of my visit in March 2018, the matchless inventory included the first Rigby 28-gauge ever produced; a Purdey .375 flanged, the only gun ever engraved by Phil Coggan and his son, Simon; and a matched pair of Purdey 12-gauge shotguns that were also engraved by Phil Coggan. It turns out this pair of Purdeys was Phil’s last undertaking before he retired as an engraver. Russell will part with the two masterworks for $550,000. Or maybe he wouldn’t. That’s the intriguing element about Gordy & Sons. Russell’s goal is not to sell the most guns or sell the most expensive guns but to have the world’s best gun store. It’s a passion that focuses on product, not profit. Outside the vault, serious hunters who aren’t ready to drop six figures on a gun will find an excellent selection in the $2,500 to $10,000 range: Caesar Guerini, Beretta, Rizzini, Sako, Zoli, Sauer, and other venerable gunmakers. The team goes to great lengths to stock a massive selection of John Browning’s final design, the beloved Browning Superposed. Still can’t find what you want? How about a .32 caliber side-by-side? That’s not a typo. Rizzini is currently finishing the prototype of the Gordy & Sons Texas Quail Special. Production will be limited to 10 over-unders and 10 side-by-sides. You probably ought not to plan on bumming shells. Like the .410, the Gordy & Sons Texas Quail Special will be specified by caliber, not gauge. 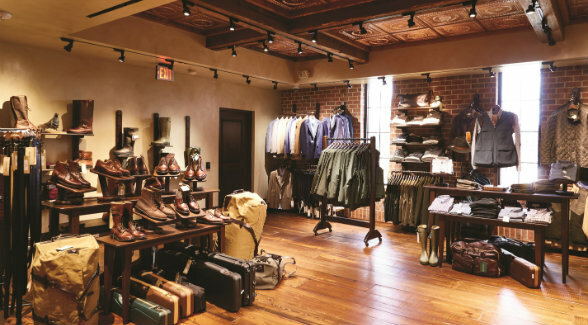 As a world-class outfitter, Gordy & Sons devotes a large portion of its second-floor showroom to soft goods and accessories for men and women, including boots by Le Chameau, hunting apparel, and Sitka gear. “For guys who think a 28 gauge is too heavy but can’t hit anything with a .410, the Quail Special should be perfect. More importantly, it’s just cool,” Russell says. About a third of the second-floor showroom is devoted to fly fishing. Garrett stocks the finest rods from Hardy, Winston, Scott, Temple Fork Outfitters, and reels from Hatch, Abel, Ross, and Galvan, as well as waders, fly lines, flies, and other equipment, and apparel from the top names in the industry. Out back, you can test drive a fly rod in an 80-foot casting pond stocked with peacock bass and other species. Garrett jokes that they “started with an unlimited budget, then doubled it.” Although his typical client fishes the Gulf Coast and stalks inland waters for trophy largemouth bass, many travel widely. “A lot of the locals here in Houston have homes in the Rockies, so they spend several weeks every year trout fishing in Colorado or Jackson Hole or Montana and even abroad. So, in that regard, we also cater to the traveling angler as well,” Garrett says. Captain Harris Dudley, one of the Gulf Coast’s most respected saltwater guides, ties custom flies for the shop and shares advice with customers. Like the late Robert Ruark stopping in at Abercrombie & Fitch’s flagship store to gear up for one of his legendary safaris, today’s hunter can swing by Gordy & Sons and leave kitted out with all the essentials: boots, jackets, hats, and ties, as well as waterfowl gear, hunting knives, and luggage of all shapes and sizes. He approaches retail sales with the same zest he brought to the oil patch as a young wildcatter: He does whatever needs to be done. Recently, his friend Jeff Hildebrand, a fellow Houston oilman, stopped in at Gordy & Sons and saw Russell in an animated conversation with a customer. “What the hell are you doing behind the counter?” Jeff asked.